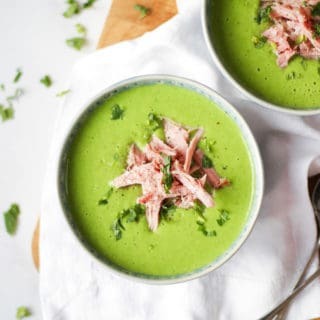 Slow Cooker Pea and Ham Soup – Made with a whole gammon joint cooked in the slow cooker, frozen fresh peas and mint for a delicious, light and healthy soup. This simple soup is so easy and warming. Add crusty bread for a really tasty meal. Oh my goodness, the snow here has been something else this week. Everywhere a blanket of white, freezing winds and school closed. I’ve spent much of the week dreaming of warming food and Baileys Hot Chocolate after sledging and snowman building. Where do children get their energy?! So with exhausted me, my little pals at home and a missed food shopping delivery (ARGH) I decided to make what I could with what I had and came up with this Slow Cooker Pea and Ham Soup. Really simple and warming, this recipe uses a whole joint of gammon, cooked in the slow cooker to make the delicious stock for your Pea and Ham Soup. I’ve used petit pois peas or frozen peas instead of traditionally used split peas as honestly? I felt that we all needed some fresh tasting green veggies! Also, look at the colour, how gorgeous is that? It makes me want to drive right in. You slow cook the joint of gammon, reserving the cooking liquid. Before adding onions, garlic, peas and mint and blending until smooth. When I drain the liquid from the cooked gammon, I pour it into my nifty gravy separator jug (similar one here for £6 on Amazon). It makes it really easy to remove any fatty parts of the stock whilst also draining any lumps. 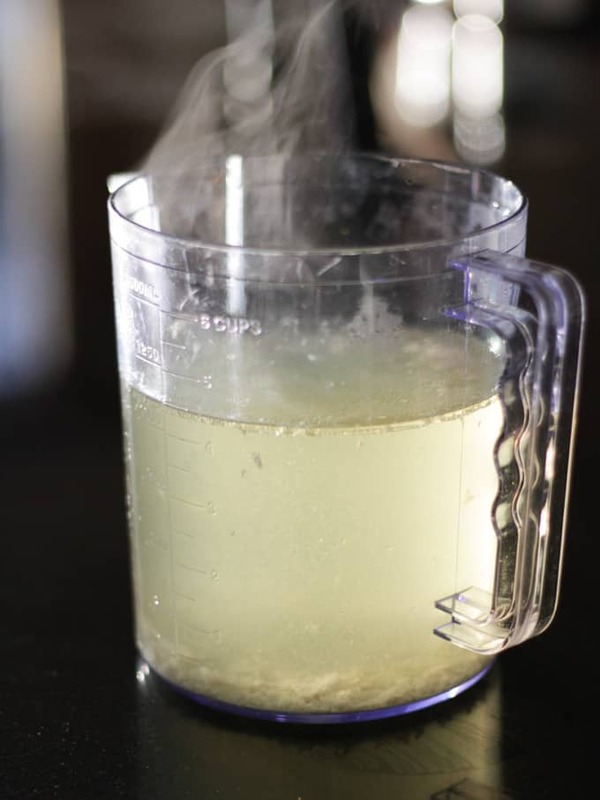 I love this jug and use it all the time for making sauces and measuring liquids. Really super useful to have in the cupboard. 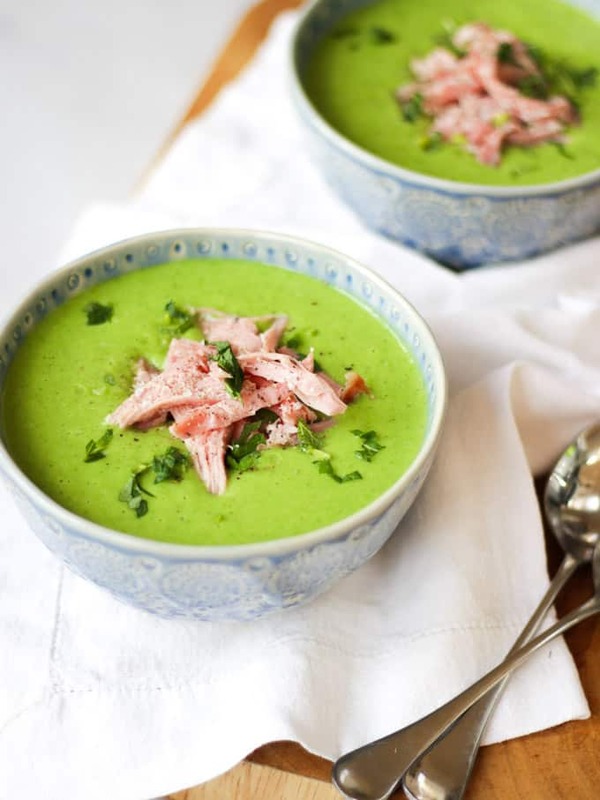 How do you cook Pea and Ham Soup in the Slow Cooker? 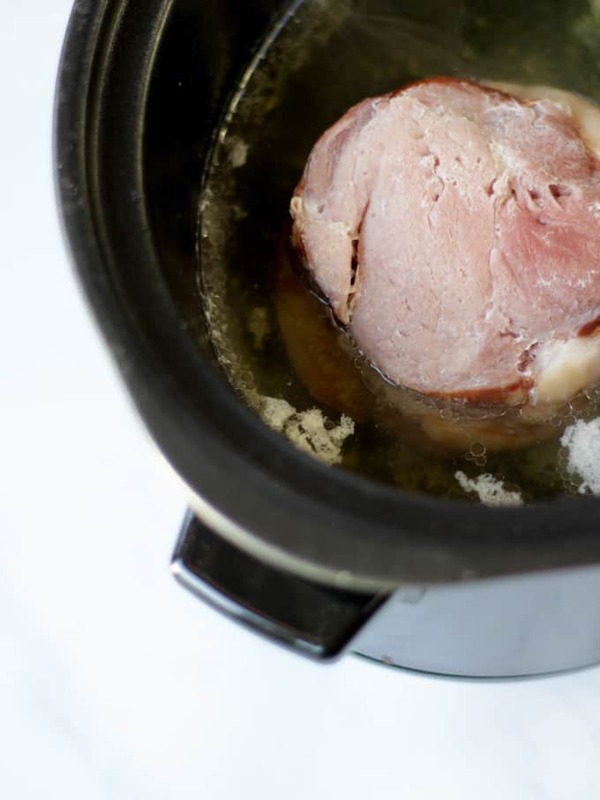 Cook your gammon joint in your slow cooker, reserving the liquid when it’s ready. Then soften some onions and garlic, I do this within the pan of my nifty new slow cooker. It’s so clever that the pan is super light and suitable for use on the hob too to save on washing up and catch all of those tasty cooking juices. The slow cooker that I use and love is this one available on Amazon, currently on offer with 25% off. Such a bargain for £25. Add the peas, and some of the cooking liquid back into the pot, heat through and then blend with mint and seasoning before adding back in your chopped ham. My Pea and Ham Slow Cooker Soup done! 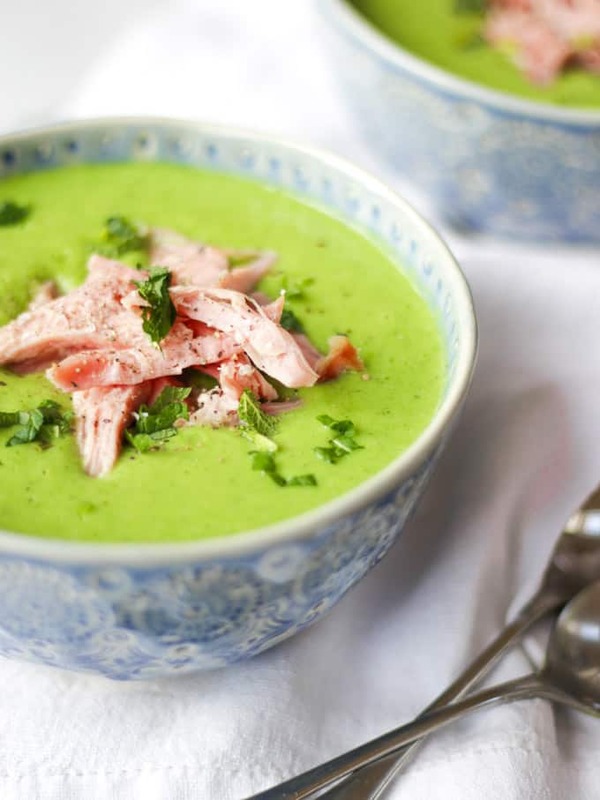 Is Pea and Ham Soup healthy? This soup uses no added sugar, is gluten free, and has very little added fat. It also contains at least one portion of vegetables per serving and is high in dietary fibre. This recipe makes a perfect take to work lunch or snack. These soup mugs are ideal and no spills if you’re travelling. I tell my children that this is green superhero soup. Why it being green convinces them that it will turn them into the hulk I have no idea but it gets them to eat it! If you don’t have time to slow cook a whole joint of gammon, you can replace with precooked ham and gammon stock. I like to use a smoked gammon joint for a deep flavour. You can also use unsmoked if you prefer. 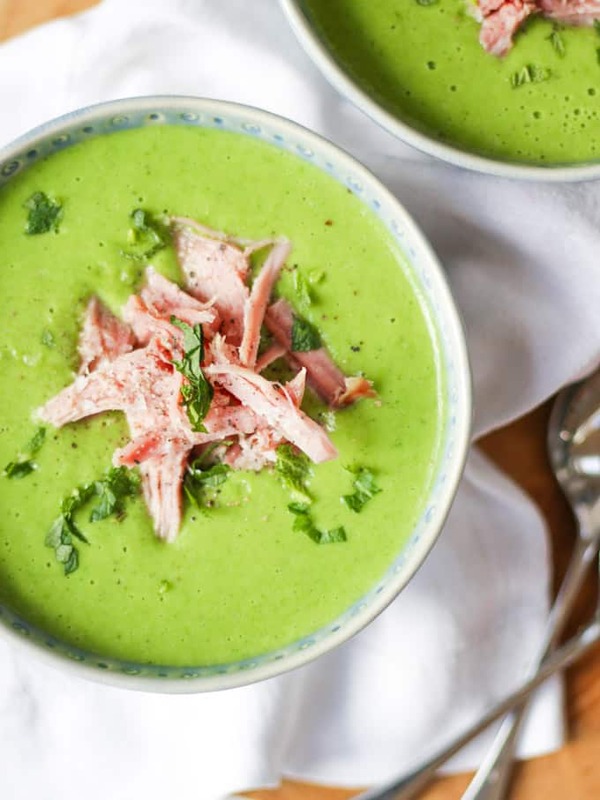 This Pea and Ham Soup recipe can also be cooked on the hob rather than in the slow cooker, just adjust your timing accordingly. Fancy some other easy soup recipes? How about my Easy Meatball Soup or my Tomato Basil Soup with Grilled Cheese Sandwiches? Hope you enjoy this recipe as much as we do. I’d love to know how you got on and what you thought of it if you make this Slow Cooker Pea and Ham Soup recipe. Please rate the recipe and leave me a comment below if you do. 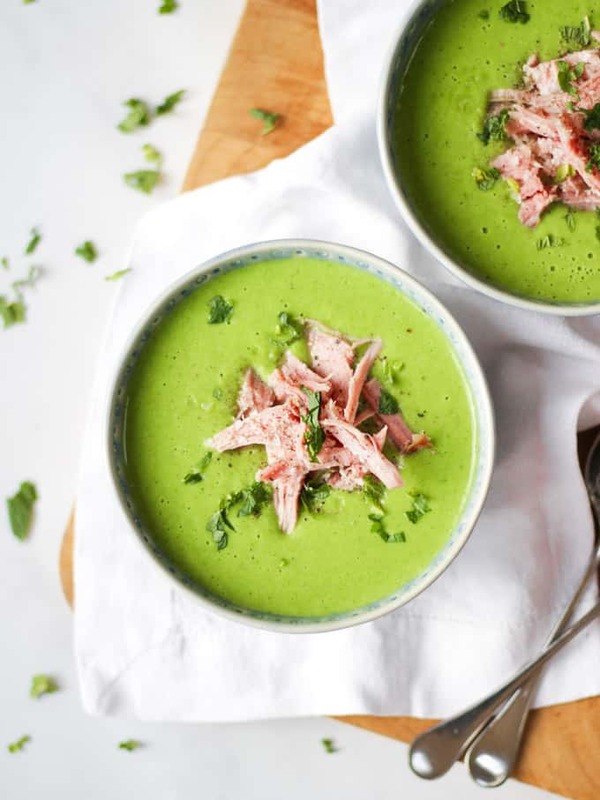 Slow Cooker Pea and Ham Soup - Made with a whole gammon joint cooked in the slow cooker, frozen fresh peas and mint for a delicious, light and healthy soup. This simple soup is so easy and warming. Add crusty bread for a really tasty meal. When you're ready, pop the drained joint back into the slow cooker, add ONE of the onions (cut in half) and add 1 litre of water. Cook on HIGH for 4 hours or LOW for 6 hours, or until the meat is soft and tender and falling apart. 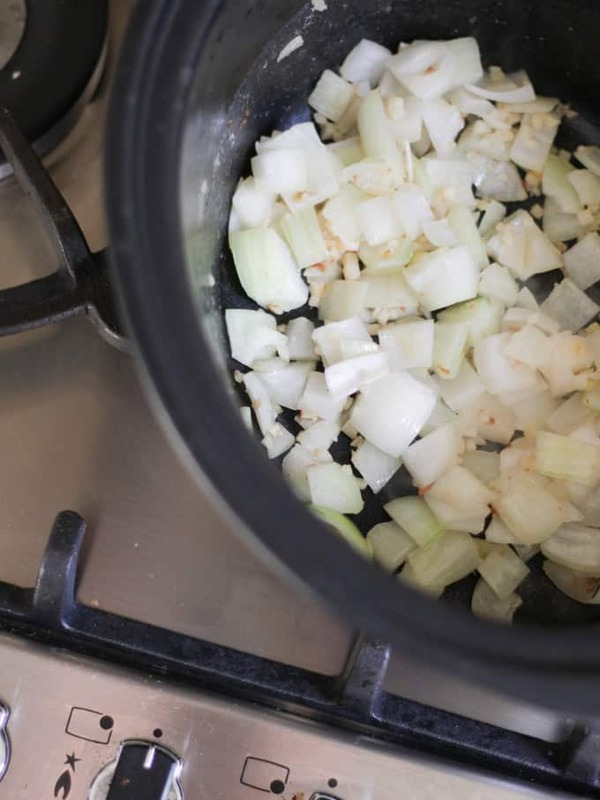 Remove the meat from the slow cooker pan, reserving the liquid and discarding the onion. Chop the remaining onion. In the pan of your slow cooker (if you have a nifty hob safe one like mine) or in a frying pan, heat the oil and soften the chopped onion and garlic until translucent. Add 750ml of the ham cooking liquid and the frozen peas with plenty of salt and pepper. Cook on HIGH for 30 minutes. 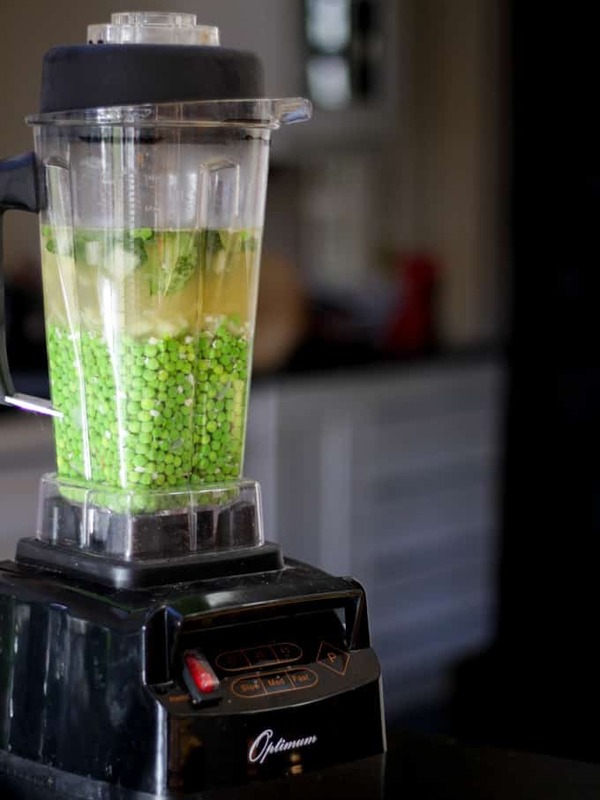 Blend the peas and stock mixture. Add a little more of the reserved stock if it is too thick. Pour the soup back into the pan, add the shredded ham (reserving some to garnish) and heat through.